Five-year-old V. Devi circles the letters she knows from a Tamil newspaper. She sits cross-legged on the floor, immersed in her work, not bothered, it seems, by a runny nose or the other children. Once their activities finish, both Devi and Kamali record their progress on individual blackboards. They then move up to the next activity: for Devi, fitting hand-made letters onto words, and for Kamali, writing words in a notebook. The girls attend a government school in Chennai’s Thiruvanmiyur Kuppam, where most pupils are the children of fishermen. Yet their curricula—known as a “ladder system of learning"—has been liberally adapted from one of the most elite and sought-after private schools in India, the Rishi Valley School. The experiment attempts to help Tamil Nadu teachers better educate multi-grade, multi-level classrooms. The ladder system is being introduced in the state’s 37,000 primary schools this year at a cost of Rs40 crore to cope with the reality of government-run schools—students from ages 5 to 9 crammed in one room to study the same subject. 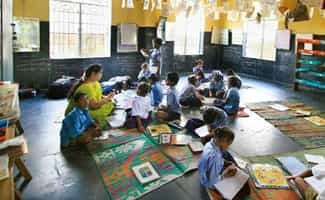 Tamil Nadu, in many ways, represents the next phase of a much-promoted universal education programme, Sarva Shiksha Abhiyan (SSA), which has put 96.5% children in school with taxpayers’ money. Estimates of children in the state attending school vary between 96% and 99%. But in recent months, bureaucrats have voiced concern over the quality of education being given, especially in classrooms where children of migrant labourers trickle in and out and teacher attendance can be just as spotty. The beauty of the ladder system is that it is a “silent revolution", says M.P. Vijayakumar, the top bureaucrat in school education for Tamil Nadu, who pushed for its implementation. World of letters: Students in a primary school in Thiruvanmiyur in Chennai. “The child decides to move to the next step, once an activity is complete," adds Vijayakumar, SSA state project director. “They record their own progress." This democratic method of learning applied to the poorest schools of Tamil Nadu ironically evolved from an expensive school located in a neighbouring state. The residential Rishi Valley School, 150km from Bangalore and 300km from Chennai, seems like paradise, cut off from the rest of the world. Nestled on 220 acres of a lush green valley surrounded by fields, the school even has a dairy farm. With the school’s acceptance rate of 10%, the elite clamour for admissions—annual fees are Rs1.1 lakh. It is known for a more holistic approach to education and a focus on nature, art and music. Teachers here write their own books and evolve their own syllabi. History is taught by linking up the civilization of four cities—Varanasi, London, Athens and Beijing; environmental science is taught by visiting nearby villages. Founded by philosopher J. Krishnamurti, it admits 320 boarders, 40 day scholars. One-tenth of the students are non-resident Indians, or NRIs. Over a lunch of rice, lentil soup, vegetables and curd, eaten with their hands, teenagers Radha Chandy, Saranya Ramachandran and Savithri M. explain that they treat teachers more as friends than authority figures. “In several of the classes, we are divided into groups and discuss our research on a subject," said Ramachandran, a class XII student who will soon sit for her Indian School Certificate examination. The exam is conducted by a council established by the University of Cambridge, initially to serve Anglo-Indian children. Students at Rishi Valley even get a say in the weekly movie they want to watch. On being asked if they miss the outside world, Chandy doesn’t miss a beat with her response: “We miss the Valley when we go into the world." Dressed in a silk sari and jewellery inherited from her mother-in-law, R. Malathy, 61, tours the schools of Tamil Nadu, mostly on a moped, sometimes on foot—rarely by car. She is the coordinator and consultant for the ladder system, which specifically borrowed from Rishi Valley’s rural education programme. “What we observed is that even those students who are attending school regularly, very few are able to read and write" after a primary school education, said Malathy. In the state’s version of ladder learning, classes are divided into teacher-supported groups, self-supported groups and, significantly, peer groups, where children learn from each other. The ladder system allows children to choose where on the learning curve they want to be, by dividing every subject into skills, and further, into activities. It also makes room for teachers coping with children of various ages studying together by focusing on a universal truth about learning: children very often learn skills from peers, especially older ones. In the classroom where Devi and Kamali sit, for example, assessment by the teacher is after four or five steps when they reach the teacher-supervised group. Another group at Thiruvanmiyur includes S. Monica, whose golden crown—it is actually made of cardboard—easily identifies her as the star of the day. She is part of the peer-supported group in which children huddle over notebooks, learning to write from each other. “They are tapping into the cultural roots of learning from mixed age groups," observes Aruna Rathnam, project officer in education for the Tamil Nadu field office of United Nations Children’s Fund, or Unicef. The agency is supporting the state SSA programme—mostly with technical assistance. “With a couple of teachers and older children, they manage a lot of numbers." In the Thiruvanmiyur school alone, six teachers teach 247 students. The ladder system evolved at Rishi Valley’s institute for educational resources, pioneered by a teacher couple, is based on extensive research carried out in 1987 on the problems in government-run primary schools in nearby villages. The method evolved with grants from Sir Ratan Tata Trust and the ministry of human resource development. The Rishi Valley School says resources such as curriculum, teachers, and some funds flow from the main school to the rural education centre to the 16 satellite schools it supports. Students from Rishi Valley also volunteer at these schools. “Parents donate about Rs2-3 lakh a year for the rural outreach programme. Some ex-students have started scholarships for students in the man school as well as rural schools", says Radhika Herzberger, director of Rishi Valley School. Tamil Nadu’s Rs40 crore cost of bringing the ladder system up to scale stems from activity-based kits, textbooks, teacher training and remodelling of classrooms. It will come from the overall Rs700 crore in the state’s SSA budget. SSA funds are collected by the Union government through a tax on personal income, corporations and services. States contribute 35% to the SSA budget through their own resources. Vijayakumar, who first implemented the system in Chennai schools, says it is too early to quantify results. But one assessment study in February cited by the National Council of Educational Research and Training, a body which designs curriculum for many schools in India, offers hope. It compared the percentage of students passing an exam from a ladder school in Chennai with the results of a regular school: 74.3% of total children in a class passed a test in Tamil, 87.15% in mathematics and 82.4% in science. The regular school’s comparative marks were 24.12%, 34.12% and 35.29%, respectively. The names and grade levels of the two schools were not specified. “We know we have a problem in education. There are isolated experiments that are doing well," says Vijayakumar. “What prevents you from borrowing and scaling it up?"